Shaun Gale believes the break from league football has done the Hawks the world of good. The team were without a game last weekend as opponents AFC Fylde were due to play in the FA Trophy. 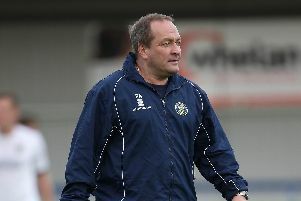 Gale insists that has allowed the squad to recharge their batteries ahead of Saturday’s long trip to Gateshead. The assistant boss said: ‘The players worked hard during the week so we gave them the Saturday off. ‘In training it was like a mini pre-season with the players putting some miles in. ‘There are times, though, when it is important to rest as well as work. ‘We have been at it full on and have a lot of travelling coming up this month. ‘The group of lads we have got are an honest bunch and they put the effort in away from the club. Importantly the breather has also provided added time to try and get some of the injured players back. Mike Carter, Dan Strugnell, Ed Harris and Bradley Tarbuck have all struggled with injuries. Carter is back in training after knee surgery, though is not quite ready to return. Gale added: ‘Carts has had major surgery on his ankle and has been out for a while. ‘We have kept him out of the contact stuff and the fact he is so close to coming back is down to his attitude. ‘He would probably play tomorrow given the chance. ‘We have to be careful with him, though, because he is coming back from a serious injury. ‘The last thing we want is to lose him for a longer period of time. ‘Ed Harris is another important player we need to be careful with but hopefully he will be back soon. Three players definitely ruled out for the trip to the north-east are Bradley Tarbuck, Paul Robinson and Swindon Town loanee defender Chris Robertson. Tarbuck and Robinson are ruled out by knee injuries. 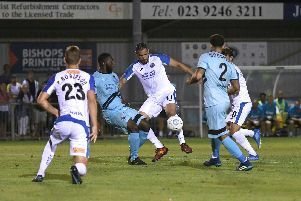 Robertson is serving a one-match suspension after being sent off on his home debut against Dover Athletic.